If the expected movement continues, by melting season there will be no thick ice with a good chance to survive the melt ANYWHERE on the Russian side of the north pole. (maybe a little bit on the border of ESS/Chukchi, but it continues to move toward an area which reliably melts.) Decent chance we see an ice shape similar to the "2030 outline" come September. edit: Air temperature has been cold CAA/Greenland side of the Arctic so the heat must come from below. That and probably the thinness of the ice isn't helping matters any. Not as much wind needed to get things moving? Your Jan 2013 - Dec 2018 piomas comparison used for an example. Re "broken up" Lincoln Sea. It isn't all that unusual, especially until the arches form in the Nares Strait. Here's an image from 1st January 2014 before the arches formed that year. No sign yet of Nares Strait blocking up. I suspect that the thickness of the chunks breaking off in the Lincoln Sea is not helping matters. In former years thick blocks of MYI would break off and help stem the flow or even block the channel. In the past couple of years thinner ice is coming down. Nares did not block until March 1st last year. This year could be as late - if even at all if the wind persists from N or E.
With choke points at both the Lincoln-Nares entry and in Kane basin, and with air temps of -30C, usually a few days come along of either a reverse wind or a slowdown due to too much ice squeezing through, thus overcoming the strong current and managing to freeze in place. So I think the probability is still on the side of an arch forming. But as the ice grows weaker and thinner, the long term prognosis is indeed towards a change in behavior at some point. In 2007 no arch formed. I wonder if it's possible to generate an animation of the ice in the Lincoln Sea and along the strait that year. Not sure if the images exist. Thanks for the comments on the Lincoln sea. I had expected hoped that with the very cold CAA weather early in the freezing season aided by additional cold from an SSW that the Nares might have closed by now. I suspect that warmer water from depth is keeping it open. edit: Thought I'd compare those images. Where can I find older images than 2009? Note that these are, so far, randomly selected years. edit: Thought I'd compare those images. Where can I find more old images like that? DMI say that "There are 18615 images in the archive from 21-06-2009 to 23-01-2019". The Kara Strait is still not frozen. Guess A: Some of the Atlantic water travelling south along the Lomonosov ridge heads south west at the Lincoln Sea, maintaining some of its southern momentum with a slower eastern momentum, but that is 'uphill' from depth. Guess B: Water from the Beaufort side of the ridge as suggested by the later images. A, B, both or neither? My uneducated guess - using seafloor topography as a measure. That's a vigorous textbook transpolar, and the Gyre seemed active this winter ending its languish deceleration of the past three years. A timid return to "normal" winter followed by a super hot summer? Yes, it's a lot of drift, though until the recent constant easterlies it could just be rotation. There's no real resistance on the atlantic side. Looking at the Beaufort Gyre over the last few days reminded me of a post from johnm33 at the end of september. Note the tail of more mobile ice stretching away from the Beaufort. Following on in the series of drawing lines on night vision gifs here is a revision of what may be happening north of Greenland. Still an Atlantic incursion into the Lincoln Sea, but taking the short cut around the coast, similar to last July (with thicker ice). Next big chunk nearing the Fram Strait might block it. Or just shatter and do nothing. Who places the bets here? Small supporting evidence from mercator (model) 92m current, dec1-jan27. It looks like the ice front between Svalbard and FJL is in for a rough week. In your opinion, is it because it's already cracked or is the current too strong or both? This has been discussed in the Nares Strait thread. To quote my betters, the floes lack the cohesive strength of previous decades and are probably an amalgamation of old ice glued with new ice, easily falling apart. I tracked the line back to roughly day248, sep5 2018 and it looks like it goes from SZ area to the north pole. Does anyone here track icebreakers? This is QUITE significant, I think. Not spozed to happen anymore. Just a little below the line now. Next big chunk nearing the Fram Strait might block it. Or just shatter and do nothing.Who places the bets here? I'll take a sportsman's bet on the big chunk at the entrance now. That it makes it down the strait. Laymans explanation: Some pressure differences often mentioned on this forum mean that water nearly always flows from Lincoln to Baffin. Water from 100m depth or more may always have been forced close to the surface at the entrance to the Nares but this year the ice is thinner and perhaps more importantly, younger. It behaves in the way shown in this and previous animations, which show it better than I can describe in words. Temperature difference is over 34C between ice and ocean at surface, air temperatures reportedly -30C or less for weeks but the ice still breaks up. Conclusion is that a lot of probably -0.5C or warmer water is weakening the ice from below. Yesterday big chunk was weakened at the front and lost its rear right end due to collisions. Today it lost its rear left and its front right wing, but it is more streamlined for the journey ahead. I wouldn't call it significant at all frankly. Weather is variable, even more so in the Arctic. 2018 around day 80 also managed to get under the mean DMI N80 line briefly. Uniquorn, in your previous post of Nares should yellow be warmer than blue? For it not to happen at all would imply that the current average is about 3 SD+ above the longer term mean. Thanks for this...really very simple. It is actually quite amazing how seldom the temps approach the long term mean. That is true, but since by day 80 the mean temperature is already inflecting I see it as the beginning of spring not winter. A queue forming in the Nares as a roughly 15km floe scrapes past the Petermann. That must be amazing to see on the ground. How to calculate roughly the volume of -0.5C water to melt a floe, say 15km square, 2m thick? Big Chunk has released the nacelle section (she canna take no more capn). Inset right shows mist (I think) clearing off the Petermann Gletscher where the area of a possible future calving (circled) is just visible in the last frames. The old ice front doesn't quite make it over the Svalbard, FJL, SZ line. Southerlies already affecting the new ice in the barents this week. Good to see the ESRL back up to date again. This chart looks pretty much the way I would have expected from where we left off before the shutdown. Laptev is continuing to slowly thicken. Most about 1.3m. How long will it be before it all turns "pink". There is a large tongue of old ice (>1.5m) north of Alaska. It might not. If the entire atlantic side continues its considerable drift towards Greenland, it will be a close call. There is ice formation of course, but it is exporting laptev quite rapidly. There's a sheer line in the compressive strength of the ice, it points towards Prince Patrick is. but may be seen as terminating in Mclure or by Banks is. 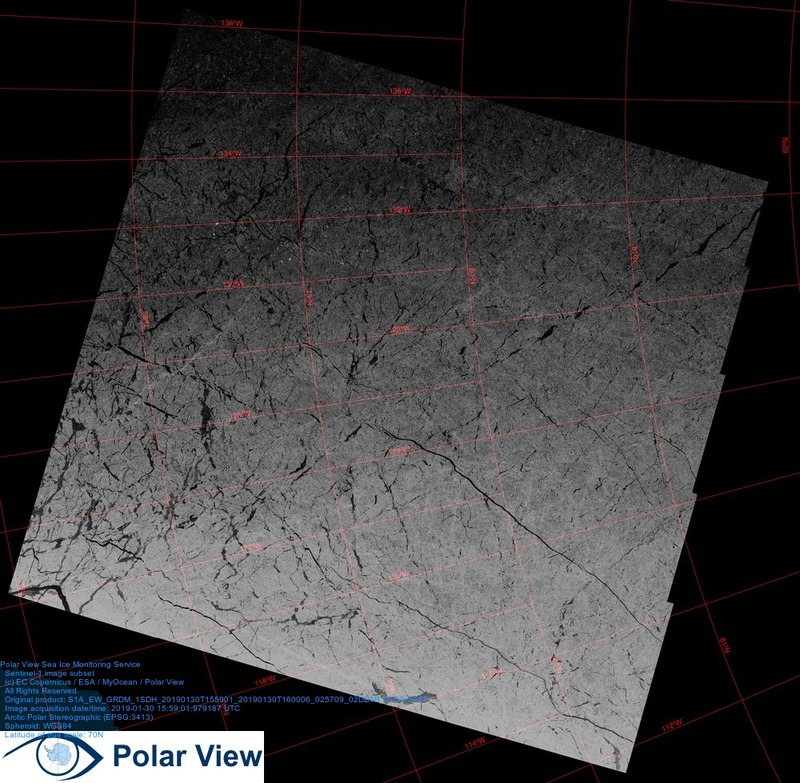 I wondered if it would actually show up on the ice, there's a diagonal line of leads opening across the polarview image which seem a close match. I'm guessing the parallel waves[?] are tidal surges coming in from the Pacific. I'd like to see these DMI graphs with only the last 5 - 10 yr average. A lot of warmth in the Pacific Gateway, the Atlantic front and even Baffin Bay. Freezing delayed or even reversed in the peripheral seas for a couple of more days?